Cleft lip and cleft palate are birth defects that affect the lips and mouth respectively. 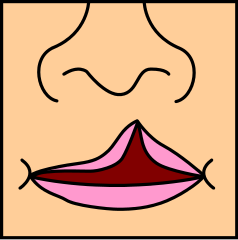 It is an opening in the lip or mouth when they do not join as supposed to. This occurs in the early months of pregnancy and is more common in boys than girls. The fetus’ skull develops during the first twelve weeks of pregnancy. Two separate plates of bones and tissues form early which then fuse at mouth and nose till the skull. If this fusion does not happen properly, it results in a cleft. A cleft palate occurs inside the mouth when the two sides do not fuse properly and is not that noticeable(until it extends to lip). While a cleft lip is more noticeable and can range from mild to severe (when the opening extends all the way up to the nose). If the mother smokes and drinks excessively while pregnancy, the chances of cleft lip and palate increase significantly. Besides if the mother is obese or lacks folic acid, then too the chances of cleft increases. Some treatments for diseases like epilepsy also increase the risk. Surgery to treat cleft may start as early as a week after birth to prepare for even further surgeries. One or two surgeries may be required depending on the intensity and severity of the cleft. After that, it may take 9-18 months for it to heal. Cleft palate is treated by surgery in the jaw. Sometimes it may be desirable to wait for 10-12 years of age when milk teeth are replaced by permanent ones to prevent repetitive surgeries. Nowadays clefts are usually treatable and do not leave much signs behind. Still further surgeries may be required in future to improve the appearance of face. Hearing loss and other ear infections. Social problems in dealing with other people, especially when the cleft is on the lip and noticeable. Therefore, it is advisable to treat the cleft as early as possible and should not be left unattended.